First and foremost....I hate myself for the mistep that I made in panel three with the snake's tail. I almost was tempted to tear the page apart and redo it but figured that right now, it's only but a draft work and it would be pointless. After all, once colored or so, could go back over it to hide the mishapen tail...still trying to find someone to help color if anyone is interested in being a part of the project. Anyway, here we have a further continuation of my comic project, despite a few days of being really busy, and now we begin to see another step being taken. 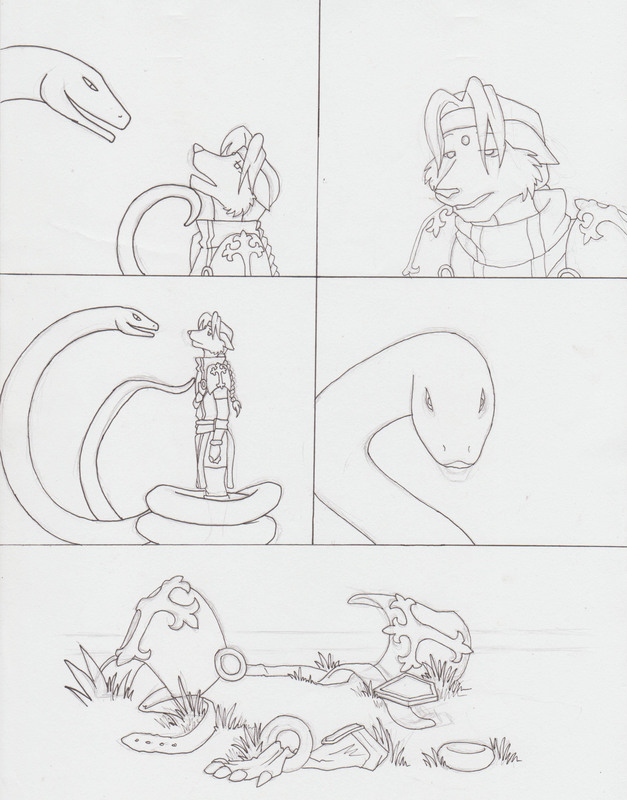 As with the last page, the snake had discovered something interesting and now, as seen in the first panel, begins to command the fox to reveal this sudden secret and since under his hypnotic glare, would be able to tell if the fox was lying. The fox relents with aide from said hypnosis and from the third panel, the fox seems pleased with what he hears. By number four, he seems to be giving Epoh a command and seen int he last panel...well...you can sort of guess what the command was. Hehe.